Ever since I posted my cleaning schedule and talked about my kids having their own chores, I’ve had a lot of comments, questions, and e-mails about our chores routine. 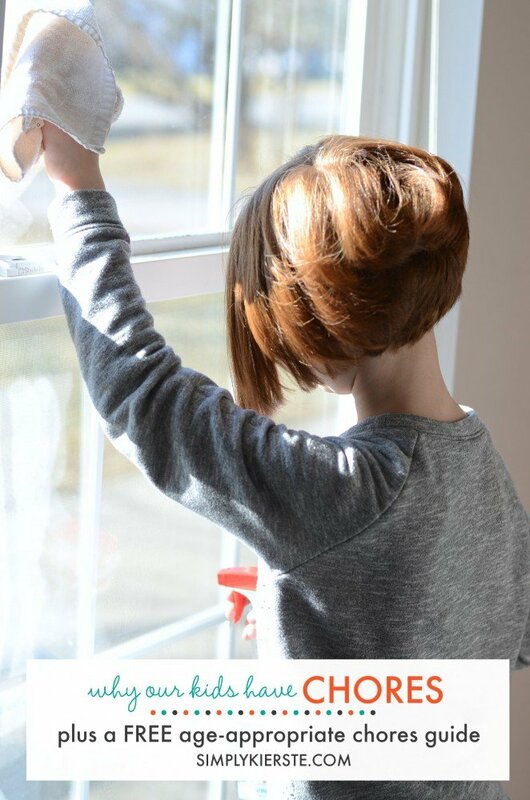 It’s been on my mind quite a bit lately too, because this year each of my six kids are turning ages where we can add a few more chores that they are able to do. We also moved from a larger home to a tiny apartment that we are living in while our new house is being built, and it’s definitely required me to make a few changes, so I figured it was a good time to write out how our family handles chores for kids, and more importantly, why. We start chores young at our house–they are are one of the most vital parts of our family structure, and not only keep our home running smoothly, but teach my kids life lessons on an ongoing basis. There are many reasons for having our kids do chores, but there are six that we feel are the most important. Belonging to a family means that we all work together, and we all take part in keeping our home clean and picked up. The burden shouldn’t fall on just one person alone. We all live here, and all make the mess. I’m at home with the kids, which means that I also do the bulk of the cooking and cleaning, which I’m happy to do. But I don’t have time to do everything, for everyone, all of the time, nor should I. All of us benefit from everyone chipping in and doing their part! I’m a mother–not a servant. I love helping my children in any way that I can, but that doesn’t mean that they get to throw their things all over the house and I’ll pick them up. They can and should be responsible for themselves, and for their things. Backpacks can go on hooks, shoes can go in baskets, clothes can go in hampers, and toys can be picked up. Learning how to be responsible for themselves helps them, and our whole family. The gift of self-reliance is one of the most important gifts you can give your child as they leave home. Teaching them the basics of life–laundry, balancing a checkbook, cooking basic meals, etc.–are all REAL life. It’s what everyone has to do to live in this world, and we want our kids to be as successful as possible. Having chores and being responsible for tasks inside the home teaches kids how to work. A strong work ethic is incredibly important, and it directly impacts them as they go to college, into the workforce, and through life as a contributing member of society. Knowing how to work hard, to do your best, to give your best effort–all of these impact so many things in their lives, and directly influence school, work, and throughout life. Time management skills are also invaluable, and learning to balance commitments at home and at school cannot come too soon. I cannot tell you how many times my kids have come to me after doing a great job helping with dinner, folding blankets by themselves, making their bed without help, putting away all of their clothes in the right drawers, or got all of their jobs done quickly and efficiently. They are excited, happy, and brimming with confidence–although they don’t have a name for it quite yet. They worked hard and accomplished something, and can’t wait to tell me about it. I LOVE it. Every time. Oh man, this is a big one for me. Our kids are so, so lucky, and it’s hard for them to always recognize that. We work hard to negate that they “deserve” anything and everything, and that just because someone else has it, they should too. Or at home, when they don’t feel like they should have to be the ones to do the dishes, or take out the trash. Nope, not going to cut it. Working hard, doing chores, and being responsible for themselves–no one else is going to make YOUR bed–goes a long way to reducing that sense of entitlement. Some may argue that chores are “‘too much”, that kids are “busy enough” with school, sports, and other extracurricular activities. I would argue the opposite. How long does it take to hang up a backpack, instead of throwing it on the floor? Or pick up clothes and put them in a hamper? Not long. If they have time to play with toys, they have time to to put them away. The time it takes my kids to do their chores is around 15-20 minutes. That’s it. They aren’t going to lose their childhood over 15 minutes of chores. Now, it might take them A LOT longer if they procrastinate or complain for an hour first, but that’s their choice, and hopefully they’ll learn that it’s a lot easier to just get it done. It’s an important lesson to learn, and will apply to many more things as they grow. My kids still have plenty of time to play, to “be kids”, to participate in sports, play musical instruments, and take ballet. They have well-rounded lives, and doing chores has only added to that. As they get older, there is more responsibility at school–homework gets harder and takes more time, and there are more extracurricular activities. Does that eliminate the need for the chores at home? No. Again, those basic everyday chores don’t take a lot of time, and for all the reasons listed above, we do expect them to be done. Even laundry when they’re old enough. My teenager does his own laundry, and I feel confident that when he leaves home, he won’t turn his underwear pink. :) Yes, high-schoolers are busy. Are they going to be any less busy when they go to college? Or start a career? Or have a family? Arguably they’ll be even busier. But after high school, when they’re on their own, not knowing how to balance doing their laundry and studying for finals and working a job all at the same time will be a lot harder. We are training them to be on their own, preparing them for life. Real life. What chores do my kids do? My kids have basic chores each day that are based on taking care of their own things: making their bed, picking up their clothes and putting them in the hamper, and making sure their toys and books are put away. They also have a regular chore that contributes to the daily running of the household, such as putting away the dishes or silverware, taking out the trash, setting the table, helping with dinner, etc. In addition, I assign an extra chore as needed, so not necessarily everyday. Those include things like washing baseboards, cleaning light switches, and washing windows. When do our kids do their chores? Teenager: He has chores that he needs to do at certain times, and other that he just fits in during the day when he can. His schedule isn’t always the same, so it does require some maneuvering. He takes out the trash every morning as needed, and makes his own lunch. After school/evening he helps with dinner on busy nights and has one other chore. On Saturdays he does laundry, and does things like mow the lawn, etc. Elementary: Before school chores include making their bed, helping to pack their lunches, folding their pajamas and putting them away (if it’s been one night) or putting them in the hamper (if they’ve been worn twice). They also help in the kitchen by putting away dishes when it’s their turn. After school they are responsible for helping with one additional chore–things like helping with dinner, setting or clearing the table, etc. We also do a whole house pick-up right before or after dinner that everyone helps with. Preschool: They are home with me for most of the day, so their jobs usually happen when I’m doing my cleaning. They also make their own beds (some with help), and they LOVE to help with windows, baseboards, door handles, replacing the toilet paper rolls, and more. This is the age where cleaning is fun, so take advantage of it! If I’m working, or busy during the day, then their chore will happen after the other kids get home from school. Toddler: This age doesn’t have many “assigned” chores–just learning! My toddlers follow me around while cleaning, and we also clean up the playroom and toys before lunch and then again before dinner or before bedtime. If they make a mess, we work together to clean it up. A lot of it is ongoing, and is about responsibility for self. It all boils down to if they make a mess, they clean it up. Right away. They don’t come home and throw their backpacks and coats on the floor–they go on hooks. They don’t get a snack until it’s done, and shoes are put away in their basket. It’s not hard, and it shows respect for our home, for me, and for themselves. If they get something out, they have to put it away, before anything else happens. If you make a snack for yourself in the kitchen, then it’s expected you will clean it up and wipe off the counters, or you won’t be able to have that privilege. No! It’s definitely not too late to start. Even if you have older kids, you can start implementing a few chores and expectations. I’m not saying it will be easy–in fact, you very well may get resistance and lots of questions. I would suggest easing into it by working together. For example, after dinner, have everyone help clean up together–parents and kids. Assign jobs and everyone gets one. If you’re all in it together, it might make the transition a little easier. We also have a “whole house pick-up” either right before or after dinner (depending on the day, and what’s going on), and the whole family is involved. We use the buddy system, and each pair is assigned a section of the house to pick up. It’s done in 10 minutes, and because everyone is doing it together, I get a lot more cooperation. At our house, chores are connected to privileges (no, they’re not rights!) for the computer, tv, and other screen time and activities. With little kids, make it a game, make it fun, use a cute chore chart that lets them get involved. Hold firm, be consistent, and while I’m not saying you’ll never get an argument (wouldn’t that be amazing??!!) it will get easier. Do I have to stay with them while they do their chores? It depends on the age and what the chore is. If they’re little, then yes–I’m with them while they pick up their toys or put away the silverware. Often times they need help with their bed, because of the way it’s up against the wall. As the they get older, I’ll teach them how to do the task several times, then let them do it on their own. If it’s cooking in the kitchen, then I’m always there, until they are old enough to be on their own (15+). Do I give rewards for chores? Oh man, this seems to be a controversial topic! I’ve seen so many posts, articles, and comments about this lately, strongly for and against. It really comes down to your own personal preference, and what you think is best for YOUR kids. Read different perspectives and viewpoints, then decide what you want to do. We don’t pay for regular chores–those are just part of being a member of our family. I do however, pay for extra chores above and beyond what I expect them to do. I want all of my kids to be able to earn money, even the younger ones, so they can learn how to save and spend responsibly, and they won’t be able to do that unless they can earn money. As an example, last summer my 14 year old and 7 year old worked together to clean out the garage. They earned a good amount to do it–it was a big job–and I was happy to pay them for it. I always have a list of jobs and the money associated with it, and they can come and ask me anytime. What are some age-appropriate chores? 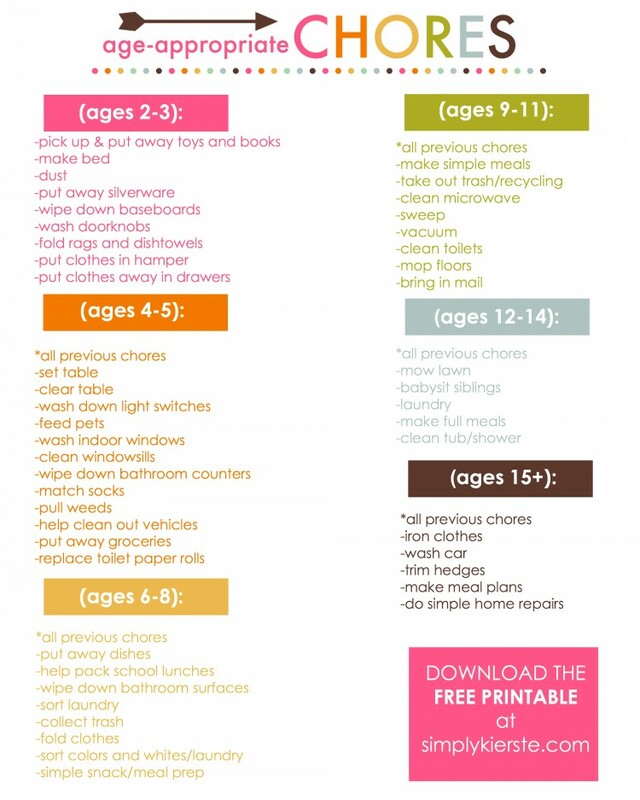 I’ve created a printable guide for age-appropriate chores, which goes into more detail. This is just a guideline, so please take into consideration your child’s specific abilities and maturity level. If you’re looking for a simple and easy chore chart, check out my Washi Tape Chore Chart! May I use it, and reference your site, in my ebook designed to help parents and children build better relationships? I’d like to reference it in a this section where I talk about improving a sense of teamwork in the family. Sure! A link back to the specific post would be great.